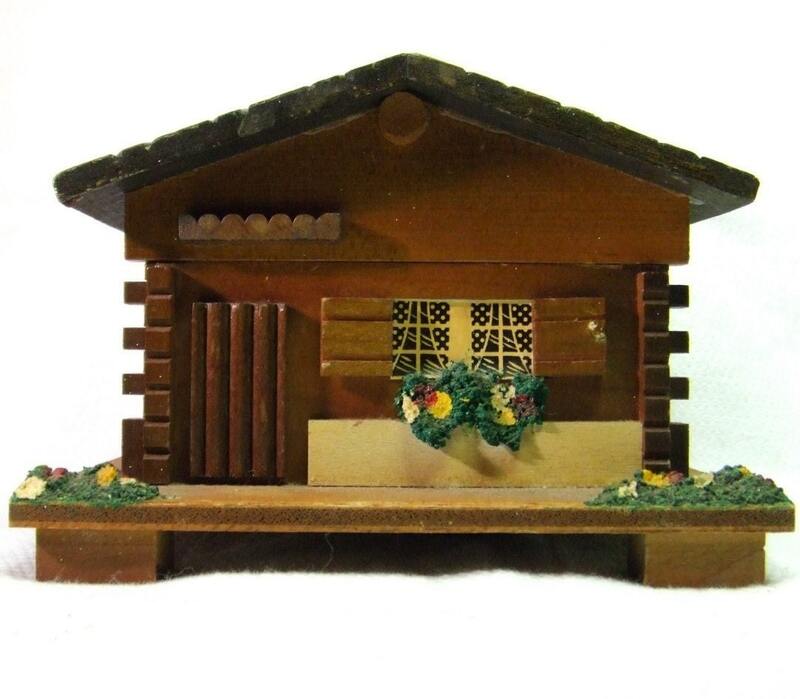 Vintage Swiss Chalet Music Jewelry Box in very good condition. The music box mechanism works, but the music plays slowly to “Somewhere My Love”. The house itself is an adorable cottage, log cabin or chalet constructed out of wood. It features include very detailed flowers under the window and at each corner, shingles, shutters, and windows complete with window dressings. The lid lifts up to show a red velvet lining on top and a clear cover over the mechanism. There is a little sticker goo on the plastic cover that has been removed since taking the picture. Stamped “Japan” on the bottom. All parts are original and no alterations have been done. “Lara’s Theme” is the name given to a leitmotif written for the film Doctor Zhivago in 1965 by composer Maurice Jarre. Soon afterward, it became the basis of the song “Somewhere My Love.” While working on the soundtrack for Doctor Zhivago, Maurice Jarre was asked by director David Lean to come up with a theme for the character of Lara, played by Julie Christie. Initially Lean had desired to use a well-known Russian song but could not locate the rights to it, and delegated responsibility to Jarre. After several unsuccessful attempts at writing it, Lean suggested to Jarre that he go to the mountains with his girlfriend and write a piece of music for her. Jarre says that the resultant piece was “Lara’s Theme”, and Lean liked it well enough to use it in numerous tracks for the film. This classic music box was discovered while going through an old antique shop. It was hidden beneath some old clothes and we were very happy to recover it.